Urine Off Bathroom Cleaner is specially formulated for daily bathroom maintenance. Urine Off works on all bathroom surfaces by using specialized enzymes and bacteria to break down the components of urine and other body discharges that cause odor and stains, as well as their proteins which host growth of microorganisms that can spread disease. The first step to a hygienic environment is a clean surface. Urine Off Bathroom Cleaner can replace all other bathroom cleaners: tub, tile and grout, toilet, sink, floor, and walls. It is easy to use and effectively removes urine and its proteins as well as other soils. 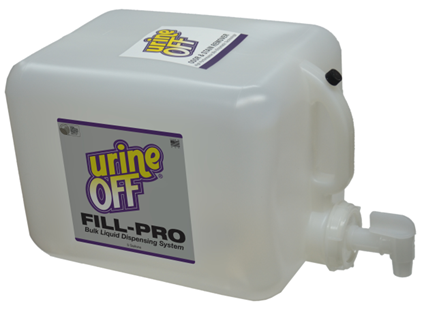 Urine Off will remediate urine odor and stains, leaving bathrooms clean and fresh. 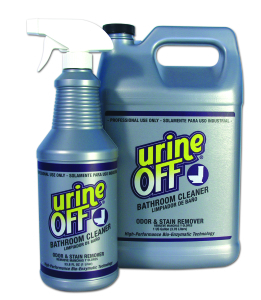 Urine Off Bathroom Cleaner is packaged in three convenient sizes for ease of use. The Fill Pro concentrate makes five gallons that are conveniently stored and dispensed from a durable plastic container. The reusable, flow regulating faucet, makes it easy to refill application sprayers. Use a Urine Off Urine Finderô Light to locate invisible bio-deposits. Spray liberally on all bathroom fixtures and surfaces. Urine Off must contact urine and other soils to be effective. Allow to stand (dwell) as long as practical. Old, heavy build-ups may require several applications and cleanings.